Our ChemAroma website, online since 2006, has been updated with a new design and more comprehensive information. Bill reports on research and the fascinating chemistry of Essential Oils. Lyn shares hands-on ideas for using aromatherapy in everyday life for health well-being, and even artistic inspiration! Welcome to the new Chemaroma - we're glad you found us. Research confirms the beneficial effects of essential oil therapy on cognitive function in people with dementia and Alzheimer’s disease. We deal with the importance of non-pharmacological therapies in many areas, including everyday stress caused by the hectic pace of modern living. Here is a restorative formula for skin care. Dr. Bill Kurtin discusses the importance of knowing about the science behind the Essential Oils (below). Why do EOs have different aromas? Why do EOs have different therapeutic effects? What factors determine the quality and stability of commercial EO products? Should I expect the same effect if the EO is absorbed through the skin or the nose? What are the safety considerations in the use of EOs? Credible scientific research has provided the answers to many such questions. The understanding of this science does not require extensive study of chemistry and biology. Our site offers access to fundamental technical concepts, stated in easy-to-understand language, which can provide a scientific foundation to support your practical knowledge. 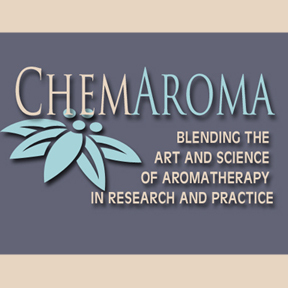 Chemaroma is a unique educational website that explores and shares helpful information on the chemistry of essential oils, their history and origins, and their applications for body, mind and spirit. We offer our information, much of it free, to individuals, organizations and community groups. ChemAroma was founded in 2006 by biochemist Dr. Bill Kurtin and artist/aromatherapist Lyn Belisle and provides information through lectures, seminars and online classes to both institutions and the private sector. Our information is research-based and practical. We focus particularly on enhancing the quality of life for older health-conscious adults, for caregivers and hospice patients and workers, and for massage/physical therapists who want to be sensitive to the needs of the ever-growing older sector of our population. We welcome your feedback and assistance in raising the awareness of the research-based effectiveness of essential oils and aromatherapy. Questions or comments for Chemaroma? Want to inquire about seminars and workshops? We'd love to hear from you.